Happy Day Before Jackson's Seventh Birthday! One day last week we were killing some time in the children's section at Borders, me and Jackson. Jackson has enough books to choke a television executive, thanks to an incredibly generous sales rep friend at HarperCollins, so we veered away from the stacks to check out a rack of Beanie Babies. 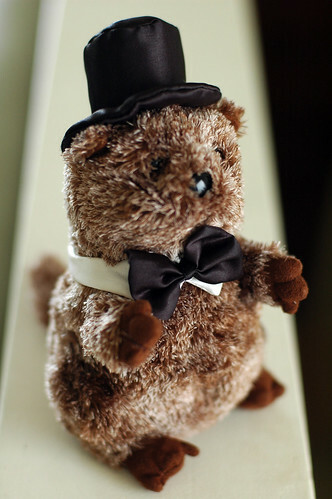 I got sort of attached to a little beaver in a satin top hat and bow tie, and when I read his tag I was excited to learn that it was actually Punxsutawny Phil, the half-price groundhog whose selling window shuts pretty quickly every year on February 3. Jackson was trying to talk me into whatever, a stuffed fish or something, and this is where I admit that when we're in a toy-buying situation I will only loosen up the $5 rule when Jackson chooses a toy that I like. So, I won't buy him the $13 spy kit he's begging me for that I tell him is full of breakable, loseable little pieces that he'll be bored with after fifteen minutes, but I will buy him the $16 whirly light-up doohicky because I want to take it home and play with it myself. And since Phil was reduced to $2.99, well. We brought Phil out to the bench where Jack was waiting for us with a smoothie. I showed him Phil. "A stuffed rodent, fantastic," he said. "No, it's Punxsutawny Phil!" I said. "He was half price!" I waved Phil's little paw at Jack, who, predictably, once I reminded him of Phil's inspirational purpose, smirked. "They saw you coming," he said. However, not one to let cynicism spoil my groundhog joy, Jackson said, "When we get home, can we watch that movie where the guy lives the same day over and over again?" I love being a parent most days, but extra much during a Groundhog Day/Ghostbusters II double feature in bed (with popcorn) on a Tuesday afternoon.